The new report shows that 1 in 7.5 people, or an estimated 755,400 people, in metro Atlanta and north Georgia turn to food pantries and meal service programs to feed themselves and their families each year. This includes more than 164,000 children and more than 64,000 seniors. Each year, 1 in 7 Americans turn to Feeding America network food banks for help. Each week, the Feeding America network serves 5.4 million individuals. The Atlanta Community Food Bank has been a member of the Feeding America network since 1979. 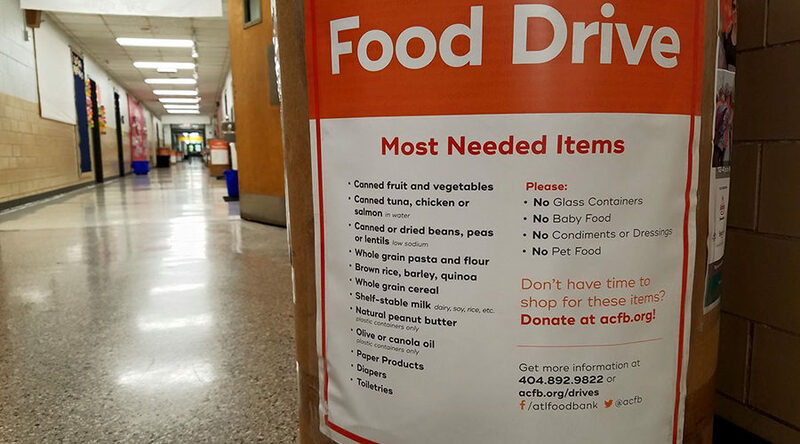 The Museum School is supporting the Atlanta Community Food Bank by conducting a Canned Food Drive that will begin on Monday, November 27th and end on Friday, December 15th. Please send canned food items such as the ones listed before by the end of the collection deadline. Unfortunately, fruit, chocolate candy, and other perishable items cannot be accepted. Each classroom will be comparing their totals with other classrooms in their division; the divisions are Kindergarten-Second Grade, Third-Fifth Grades, and Grades Six – Seven. The classroom that collects the most cans for the division will be recognized as a leader by The Atlanta Community Food Bank and participate in a Hunger 101 Session, here at TMS, that outlines strategies for leaders in the community, of any age, to make an impact on hunger. Last year, TMS collected 2,966 food items which equaled 2,726 pounds of food for distribution. Please continue to support our Canned Food Drive and our 2017 goal of distributing 3,500 cans within the community! Help us bring nourishment and joy to those in need!